You can't help but have a fun-filled holiday here at the Costa Encantada ' it's a sizeable complex where everything is done on a grand scale. An extremely friendly place, where the English-speaking staff are always happy to help, you can indulge yoursef. this was the first time we stayed here and thoroughly enjoyed it. the rooms were very spacious especially the separate kitchen which was well fitted out. the rooms were also cleaned every day. 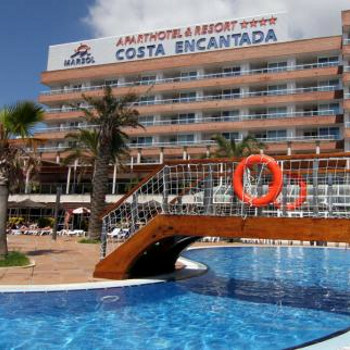 the swimming pool was brilliant plenty of sunbeds always available staff were very friendly. we stayed half board the food was great but there could have been more variety but as they say its the quality not quantity that counts. the location was very good just on a slight incline but it wasn't too bad we all had agreat stay here and would recommend. the only complaint there was not a lot of entertainment this could've been better. We stayed at this hotel witch was clean cosy and above all friendly, though the hospital was close but did not spoil our week. The staff and reps were out of this world we still have very good memories and photos of my kids with the reps on the day we were leaving they lined up with our kids no problem lots of smiles and happy memories. The beach or playa was a short walk past the roundabout down to fennels playa ,got the boat and went up then down the coast tossa blanies fennels . The bar staff were very pleasant the maids were very good this hotel was owned by air tours and I can find no faults at all. We did dine in the hotel twice and found the meals perfect. Would I visit this hotel again? Yes I would without a care in the world .can’t wait and we are looking forward to the next time. we stayed at this hotel witch was clean cozy and above all friendly the hospital was close but did not spoil our week the staff and reps were out of this world we still have very good memorys and photos of my kids with the reps on the day we were leaving they lined up with our kids no problem lots of smiles and happy memorys the beach or playa was a short walk past the roundabout down to fennels playa ,got the boat and went up then down the coast tossa blanies fennels .the bar staff were very pleasent the maids were very good this hotel was owned by air tours and i can find no faults at all.we did dine in the hotel twice and found the meals perfect .would i visit this hotel again yes i would with out a care in the world .cant wait to see hol brocures lookin forward to the next time . Just back from holiday and had a wonderful time! The age ranges of people who went were myself (19), my parents (40-45), My parents friends (40-45) and also their daughter(20). We arrived at hotel around 4 on sunday morning, man at reception wasn't very nice, also secuirty guard quite rude as well. Got to room and although we had booked half board we got a kitchen and living area, which was very clean and had everything you needed. During the day the pool, which was cleaned every night, was great, espically for children as there was a small pool at the back designed for children. They had a pool bar serving snacks and drinks, and entertainment from the animation team who were very lively and enthusiastic and really kept the holiday spirit going. Plenty of sunloungers as well so you were never stuck without one. I wouldn't advise anyone to go on halfboard in this hotel as there wasn't very much choice the first time we were in, and the second night we went, the meat from the previous night was put out again with sauce over it. Also, my father had a tummy upset after eating out of there. At night there was a bar which had live entertainment in it with a disco for kids. Wide selction of cocktails and bottled beers, very nice staff there, although bar closes at 1 so if you want more partying the nightlife is around a mile away. The location was very good as you weren't in the centre of things but you were within walking distance of the beach and the centre, which also gauranteed a good nights sleep as you didn't hear any drunks or music. Overall, good holiday had by all, difentely thumbs up for fmailies with young children as the resort is family orrientated! The hotel was very clean and we got our beds changed every other day ..we also got our towels changed every other day too !! We ate in the hotel restaurent once... it was breakfast..it was just OK ! The location was good and close to local shops..the main town was a short walk from the hotel..the hotel staff were nice. In the restaurant they were just OK.
We are just back from Costa Encantada aparthotel, lloret de mar, Costa Brava. We arrived late Sunday morning around 4.30am to be greeted by a very friendly man at reception. We got to our room within minutes and were very pleased with what we saw. It was a 2 bedroom apt., very clean and plenty of room for all 5 of us. The room was on the fourth floor overlooking the front entrance. Our 2 daughters aged 9 and 12 had a bedroom to themselves. Our son aged 14 had the living room pull out bed right in front of the tv which had english speaking programmes. We had a twin bedroom with patio doors, out onto the balcony. The air conditioner worked very well. The cleaners came in every other day. Our towels were changed every other day. We had to bring out our own bin bags to an area at the back of the hotel. We had lunch in the apt which had a small kitchen but had all you needed. including a new tall fridge freezer, new hob and cooker and a toaster. We got the food down in Caprabo super market which was very cheap and less than 100 metres from the hotel. The bread was lovely and just freshly baked. We never ate in the aparthotel but we did speak to people who did and they highly recommended the food. Our 9 year old daughter had great fun in the Sharks kids Club with Jemma and Malcolm from 2pm - 4pm. There were lots of sunbeds and even when we wandered down at 11am there were still plenty available. Music by the pool was very good. The refs entertained us by water excerise, water polo and football etc.Over all we would highly recommend this aparthotel and would go back ourselves. Fantastic hotel - spotlessly clean in all areas - rooms and the hotel and pool. Beer very poor quality in the hotel and bar staff were particularly slow and seemed unhappy in their job. Excellent entertainment for the kids, although ours were older teenagers so not interested in the Kids Clubs (although I have heard that My Travel are not selling this as a SunCentre in 2008, so there won't be all the same level of entertainment then). Rooms were a nice size - suitable for all you needed and were cleaned regularly. The Hotel shop was pretty well stocked and had most essentials if required although slightly over priced. Hotel food in Pool side snack Bar and Restaurant was basic and not much variaty. For a small fee you could use the half board restaurant and that was quite nice. Hotel Location on a hill and we could hear Ambulances passing by. Also quite a walk from main town centre with busy main roads. Hotel staff not very friendly but Entertainment staff made up for this. Excellent shows but you need to be sitting near the stage area as concrete Columbs are in your way. First time in this resort and apartments! We found the apartment we stayed in was okay, kitchen was a bit small but apart from that it was fine. The staff in the hotel were lovely and happy to help. The pool area was always clean and there is plently of sunbeds. Only fault would have to be the maid service, as apartments were only cleaned four times a week. You also have to empty your own bin in your apartment. Where our apartments were situated you mostly heard ambluances passing by which got annoying after a while. You also have to pay for the air conditioning in the apartments.